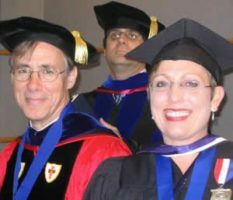 Faculty wear academic regalia at the baccalaureate and commencement ceremonies. Regalia can be ordered through the OCU Campus Store. Contact Christina Chapman at (405) 208-5112. The following is a list of procedures we will follow for graduation on Saturday, May 4, 2019. The Baccalaureate worship service will take place at 9:00 a.m. The faculty will gather in the Allison Room (formerly the Memorabilia Room) inside the Bishop W. Angie Smith Chapel. Please arrive at the chapel by 8:40 a.m. robed and ready to line up. The commencement ceremonies will be held in the Henry J. Freede Wellness and Activity Center. The morning ceremony will begin at 11:00 a.m., and the afternoon ceremony will begin at 3:00 p.m. Faculty should meet in the Leichter Reunion Room, located on the second floor of the Freede Center. Please robe prior to arriving at the Freede Center. Vice presidents, deans, and associate and assistant deans will meet—and robe, if necessary—in the men’s dressing room in the east hallway. There will be signs indicating your robing area. Faculty should be robed, lined up and ready to process no later than 10:40 a.m. for the morning ceremony and 2:40 p.m. for the afternoon ceremony. Please remember that there is not a secure area to leave your purses or other personal belongings. Please leave them in your office or locked in your car. Faculty marshals will be present to assist all groups.